On November 1, 2012, EU regulation on the labelling of tyres became a legal requirement for both manufacturers and retailers of tyres. The label, which is displayed at the point of sale, provides information on fuel efficiency, wet grip and external rolling noise through clear pictograms. The label allows consumers to make informed choices when buying tyres, with performance ranked on a scale from A (best) to G (worst). The energy lost when a tyre is rolling is known as rolling resistance. A lower rolling resistance reduces fuel consumption and carbon dioxide emissions. The highest-performing tyre is A, with G having the worst performance. The difference in fuel consumption between a car fitted with A and G class tyres is around 0.5 litres per 100km. This provides you with details of the tyre’s grip on wet roads. A tyre with excellent grip has a shorter stopping distance on wet roads. The highest performing tyre is A, with G having the worst performance. The difference in wet braking distance between a car fitted with A and G class tyres is over 10 metres, which is equivalent to 2 car lengths. 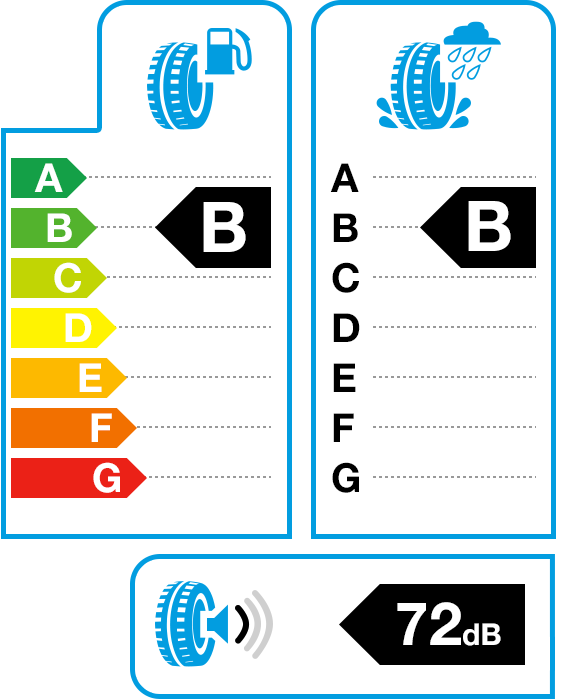 A tyre’s exterior noise rating is expressed in decibels (dB). One black wave signifies the best noise level, at least 3dB below the legal limit. Three black waves indicates the poorest performance. The noise level refers to the noise of the tyre from outside the vehicle while rolling with the engine turned off.